Are you a Construction Management graduate looking for a unique Design-Build team to work with? Do you have a high energy, positive, enthusiastic attitude and believe in servant leadership? Are you detail orientated, self-motivated and committed to the process of life-long learning? If you answered yes to all of these, we’d like to talk to you. Minimum 2 summers of field labor experience and a Construction Management internship. Project knowledge – know the project scope, approach and details as well as the Project Superintendent on site. Sets a goal and takes action to conquer it! 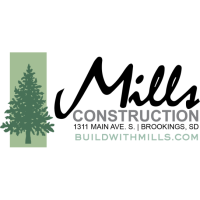 Please visit www.buildwithmills.com for more information about Mills Construction Inc, and to apply for this position. Your resume can be sent to millscst@brookings.net . Thank you.